It’s my 50th Birthday Celebration, Day 44. Here’s the scoop: because I feel so lucky and have pretty much everything I could ever need, I am asking people to get involved with charities, if they are so inspired, in lieu of any fabulous birthday presents you were planning on sending me (or not). The other day I went to the cell phone store and the same guy who sold me my phone 5 years ago was still working there. I walked in and immediately started haranguing the poor guy about going to college. He’s young, he’s smart – I think he should go to college. But I think almost everyone should. Scholarship America is built on that premise – that everyone should get the chance to go to college. Scholarship America believes that every student deserves an opportunity to go to college, regardless of their financial status. Since its founding, Scholarship America has distributed more than $2.5 billion to 1.7 million students across the country through various programs including Dollars for Scholars, Dreamkeepers, and Scholarship Management Services. As we celebrate our 50th anniversary and enter our second half-century of helping students, we invite you to become a part of our mission by donating or volunteering today. 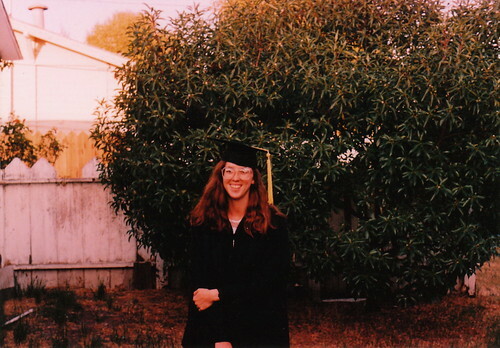 Me on graduation day, in the back yard of my student hovel. Donate here. They also need local volunteers. I do so love that picture of you. I had a heavy hand with the henna that year. My mom was still giving me crap about it the other day.